Dandan noodles or dandanmian (simplified Chinese: 担担面; traditional Chinese: 擔擔麵) is a noodle dish originating from Chinese Sichuan cuisine. It consists of a spicy sauce containing preserved vegetables (often including zha cai (榨菜), lower enlarged mustard stems, or ya cai (芽菜), upper mustard stems), chili oil, Sichuan pepper, minced pork, and scallions served over noodles. Sesame paste and/or peanut butter is sometimes added, and occasionally replaces the spicy sauce, usually in the Taiwanese and American Chinese style of the dish. In this case, dandanmian is considered as a variation of ma jiang mian (麻醬麵), sesame sauce noodles. In American Chinese cuisine, dandanmian is often sweeter, less spicy, and less soupy than its Sichuan counterpart. The name refers to a type of carrying pole (dan dan) that was used by walking street vendors who sold the dish to passers-by. The pole was carried over the shoulder, with two baskets containing noodles and sauce attached at either end. As the noodles were affordable due to their low cost, the local people gradually came to call them dandan noodles, referencing the street vendors. Literally, the name translates as "noodles carried on a pole", but may be better translated as "peddler's noodles". The same sauce is frequently served over poached chicken (called bonbon or bangbang chicken (棒棒鸡)), and on steamed, meat-filled dumplings in another Sichuan dish called suanla chaoshou. 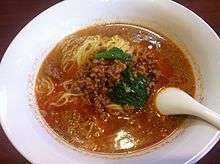 The corresponding Japanese dish is tantan-men, a form of ramen (formally 担担麺, as in Chinese, but often written with 々, or with 坦 instead of 担). ↑ Dunlop, Fuschia (2008). Shark's Fin and Sichuan Pepper. W.W. Norton & Co. ISBN 0-393-06657-6. 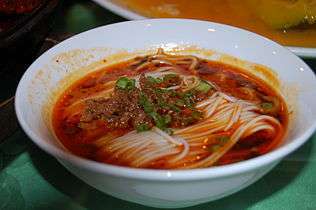 Wikimedia Commons has media related to Dan dan mian.